Once again, I am talking about the old days and my sweet and sour story. I beg your pardon for the continuation of this part two of my old house kitchen. Back to the olden days again, to own a refrigerator is like owning an expensive continental car. We have a special cabinet designed to store the unconsumed balance foods for the next day as foods are precious and we can’t afford to throw it away. The design allows air ventilation so that food will not turn foul easily in this humid climate. The netting also keeps away flies and other insects for sharing the food. The legs were supported with bowls filled up with water sprinkled with kerosene or salts to deter ants from entering the food cabinet. Well, some ants still managed to swim over to the flourish land in exchange with some number of drowning incidents! 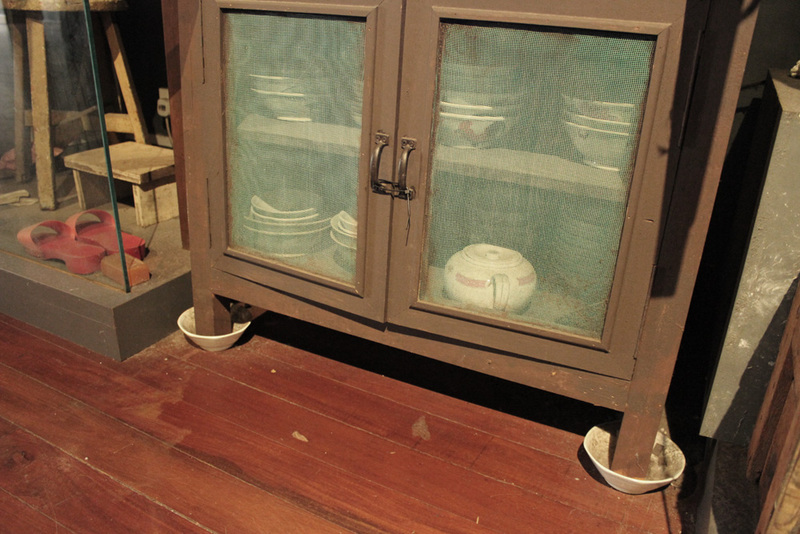 Some of the cabinet compartments came without doors for storage of bowls and plates etc. It’s is easy to pick up whatever you want just at a glance! 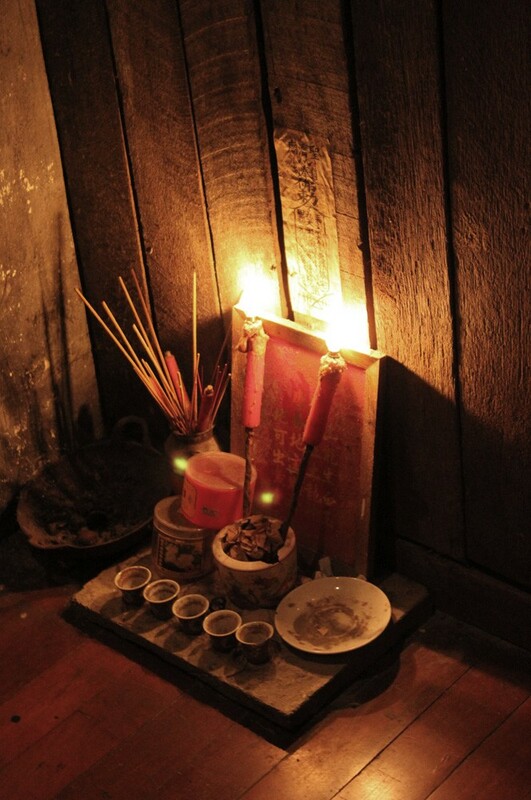 Offering prayers to stove god, Vesta is also quite a tradition among the Cantonese here. The altar is always placed on the ground in the kitchen area. It is believed that the stove god will protect the owner and ocuupants of the house to have a full stomach throughout the year and guard the kitchen in a safe condition. This entry was posted in Life / 生活 and tagged Cantonese, Kitchen cabinet, life, photography, postaday, Religion and Spirituality, Singapore. I thank you on behalf of the kitchen cabinet! well, you told his story! Better than the real Sydney right? Haha! Have a great and peaceful weekend! I like the design of the cabinet shelves. I put this design on the top shelf of our bookcase. Yes, those ants are persistent little creatures. We have to take measures here also. Thanks, Samuel! For those days having open shelve, I believe is to do with the materials costs. Thanks! Lately I just thought about you! Interesting that the Cantonese pay homage to Vesta, a Roman goddess. But if she can protect your kitchen, why not? Especially if she can protect against ants in the kitchen….I hate that! I love this story of the kitchen cabinet, Sydney. It explains, in part, the way the Chinese cook! Thanks, Cathy! I hope you enjoy what I wrote, I got so much more to pick up from you! Very interesting. Maybe the ants did get across the bowls when the water inside them dried… and you forgot to replenish the water or kerosene. Such bowls always worked for me. Oops! You spot it! But that is not mine! I captured those pictures in Chinatown Heritage Center. Haha! You got a pair of sharp eyes! That was a very nice post, you are always so full of knowledge and learning about your culture is really fascinating. I am not as knowledgeable as a professor, but I try to shared with the world what I know and how I look at things. Thanks for your compliments, you really make my day ( although my day left 3 hours)! Cheers! I like the way you name it “golden days:, that was the days I was protected by two angels. Thanks for sharing your “olden” days — it’s a beautiful reminder to be grateful for all we have, including our precious memories! Yes, it can’t erase from my book! Thanks, Melia! Thanks for reading and listen to my sweet and the sour! That means you are old enough for the story sharing! 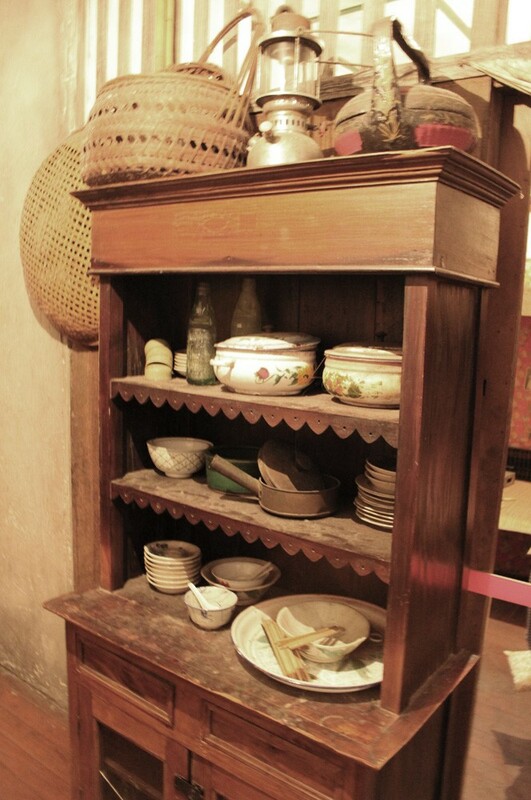 My grandmother also had a cabinet with netting for food and a larder also – which was just a part of the house that had a small netted window to keep food cool. Your kitchen god sounds very like a Roman kitchen god – they had gods for every area of the kitchen….. I believe we are having the same kitchen god, is just like we are having the same language. I also thank you for thank you me! Haha! Let’s cheers! Beautiful pictures of a beautiful corner of the house. Thanks, Steve! You are always welcome to my house! Thank you, that’s a very nice comment. I’m sure your house is beautiful and full of serenity. Sydney, did your parents ever tell you the story, about how the first ants would drown, so the following ants could use them to cross the water? I always thought my parents were pulling my leg, but these days I wonder. I had never heard that before! But what i was told they managed to learn scuba diving from somewhere and reach the island across the ocean! Those old cabinets are beautiful. I think I saw something like them in an antique shop. Yes, yes! You are speaking on behalf of them! Is priceless! Those picture was taken at Chinatown Heritage Center.